Dosing Pump targets brewing industry. Designed for accurate metering and dosing of finings added during brewing of beer, Series 620 pumps provide 2 levels of PIN-secure process protection to prevent accidental damage and avoid any inadvertent changes to pump settings. Providing control ratio of 2,650:1, single pumphead is capable of 4.8 gpm and pressures up to 60 psi with metering accuracy at Â±1%. Units come with no valves or seals to clog, and require minimal maintenance. Watson-Marlow Bredel, the leading manufacturer of peristaltic pumps, has launched its 620 Finings Dosing pump for the brewing industry. The 620 is designed for accurate metering and dosing of finings added during the brewing of beer, which are used to produce a bright, clear appearance. A single 620 pumphead is capable of 4.8 gpm and pressures up to 60 psi with metering accuracy at ±1%, which is necessary to ensure the correct dosage of finings is added to each batch of beer, and provides unrivaled performance with a control ratio of 2650:1. With no valves or seals to clog, the 620 Series pumps require minimal maintenance, resulting in reduced downtime, providing a cost-effective alternative to other pump technologies. The 620 Series offers an exclusive, innovative PIN-secure process protection feature that provides two levels of PIN protection. The speed range can be capped to prevent accidental damage and keypad functionality can be disabled to avoid any inadvertent changes to pump settings. The keypad can also be disabled in remote installations to prevent tampering. 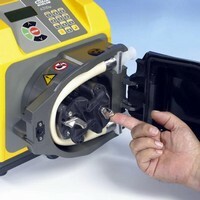 Every Watson-Marlow Bredel peristaltic pump is an inherent metering pump with repeatability at 99.5%. Many models include integral digital drives and displays in washdown enclosures. These self-priming pumps accommodate flow rates from 0.1 microliter to 350 gpm, and are extremely durable, withstanding pressures up to 232 psi. There are no internal universal joints, valves, dead corners, or glands to impede flow, and these pumps are reversible for back flushing lines. They can also run dry indefinitely without damage and provide up to a 30' suction lift.